Good morning! Welcome to Three Minute Thursday, the one-stop shop for not only fast card ideas but also the supplies to make them! Just send me an email or give me a call on 01280 820593 and I'll do the rest for you. You could be inking up your new stamps within a week! First up is a card with a very 70s retro feel. This is all about colour - each 'stitch' was stamped in mustards, oranges and rusts in a pretty haphazard fashion. I finished with a sentiment from Trendy Trees, stamped in Cajun Craze using my stamp-a-majig. Next I focused on this 'satin stitch' using a favourite colour combination of mine: Elegant Eggplant, Night of Navy and Rich Razzleberry. I used my stamp-a-majig to align three rows of stitches exactly above each other. Very simple again - I just stamped the 'running stitch' in Garden Green, Not Quite Navy and Pacific Point all the way up the card. Each time, I stamped several times without re-inking to get a nice range of colour. I love these colours together! The sentiment is from the hostess set Afterthoughts and, I think, makes a real impact in Basic Black against the stitch pattern. Hostess sets, for those that don't know, are free to those that host a qualifying workshop or to those that place an order for £150 or more. Email me to find out more or to book a fun evening! Talking of fun evenings: yesterday, with trembling fingers, my oldest son handed me all his hard-earned savings so that I could order him an Xbox online. He'd bookmarked one but remarked wistfully that the model with bells and whistles on was only £10 more. It was then that something truly astonishing happened. My 15-year-old daughter, who was in the room, said casually: "I'll lend you ten quid if you like." There was a silence while this sank in and then my son ran over to my daughter and HUGGED HER!!! And then he TOLD HER THAT HE LOVED HER!!! Now, my children get on pretty well on the whole but I can safely say that never before has there been such a demonstration of affection between these two! Thank you for visiting my blog - I love it that you spend a bit of your time here with me. I'll be back tomorrow with a birthday card I'm making for my 12-year-old niece and I'll hope to see you then! Wow! What a great set of cards! I "whacked" a wheel for a card today and just posted it. I put some links to your blog for instructions. I hope you don't mind. Thanks so much for all the inspiration! 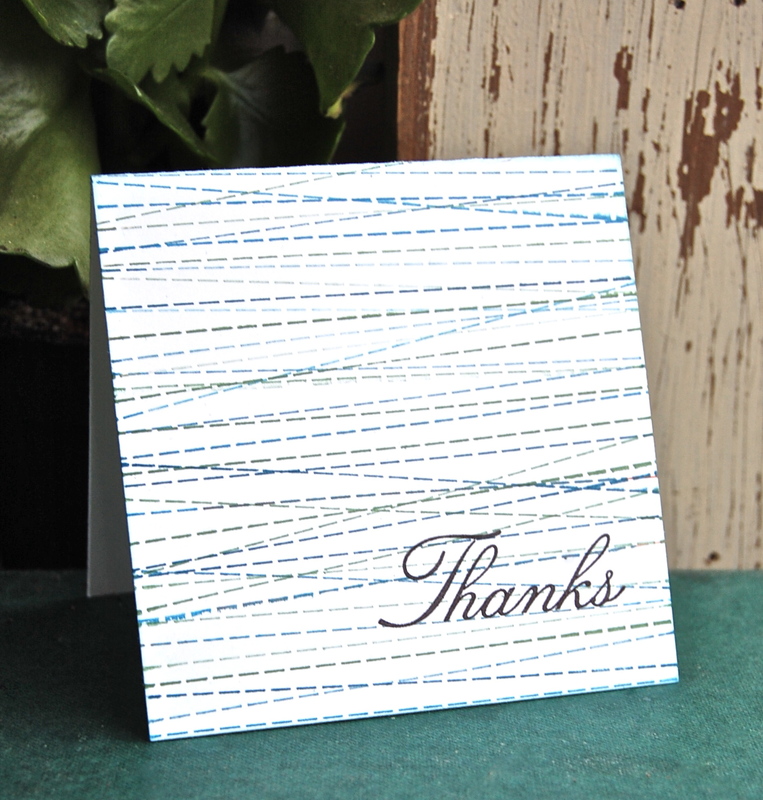 PS I gave you a shout out at Splitcoaststampers too! Fabulous cards Vicky! This 'In Stitches' wheel is deinately on my wish list now! I love all 3 and can't pick a favourite, although I do particularly like the satin stitch stamp out of the stamps you've used! How sweet of your daughter to help her brother out like that, that's sibling love for you! Beautiful cards. I will be ordering the wheel and attempting to unmount it soon! Hope your son enjoys his new games thing. How much interest is his sister charging?! Wow - you've got it all sewn up Vicky!! LOL! Hi Vicky! Just love your colour combos- you will be seeing them on my blog soon I bet. And your "sewing" is fab too. Aren't I lucky to have a friend who is so talented??!! Hi Vicky, These are a great set of cards, I have resisted this stamp so far but I am weakening the more I see you doing with it !!! Beautiful cards it's always a pleasure to visit and see what you have been up to ans am never disappointed. That was so sweet of your daughter. Way to go, Vicky, you have turned that roller into a treasure trove. Very clever and simple cards. 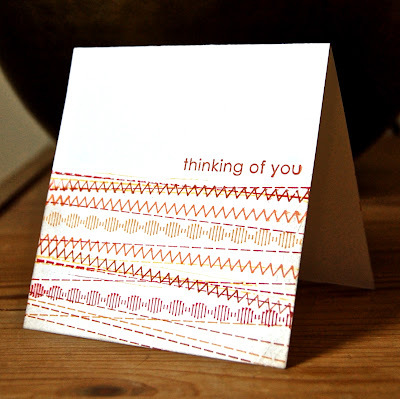 Wonderful cards with the stitches stamps on them... every card is so unique and the colors so fabulous together. The description of the money-lending interchange between your two oldest brought a smile to my face and tears to my eyes. It is so great to see your children be generous to and appreciative of one another!